Seeing all that happened in Charlottesville, VA this past weekend was truly disappointing and repulsive. The most viewed photo of the all the men and women holding torches in the night was crazy. I couldn’t believe my eyes. Then to see men and women marching in broad daylight with their military guns so freely was also frightening. About a year ago from this date I was telling my daughter how lucky she was to grow up in a time where she didn’t have to deal with such outward displays of prejudice, fears, and the anxiety of wondering if you had to fight back. However, seeing the chaos erupt right before my eyes on Saturday, made me feel uncomfortable for not only myself, but for my children, too. What was to be a gathering of all who opposed the removal of the Confederate statues turned into total mayhem when they began to clash with the anti-far-right protesters. From there on out the environment turned broke out into pandemonium. Hate is beyond me. In order to prove worth and superiority we don’t need to demoralize or find fault in others. Oprah once said, if we continue to look back to evaluate how the other guy is doing we will never win the race. History teaches us many things. Some things we have learned from and other things we have cultivated and improved. The nation is full of many people who will not agree on the same ideas or ideology, but that is what America was founded on. One nation under all, working together to improve our nation to be the best it can be for each and every individual. No matter their race, heritage, gender, sexuality, and whatever other difference an individual may have. It’s important that we acknowledge the current events and discuss the issues. We should not be ignoring this because if we do that then we are only giving more power to the bad people. If you have the ability to have your voice be heard speak out against the hate. Talk about it with your children, friends and colleagues. 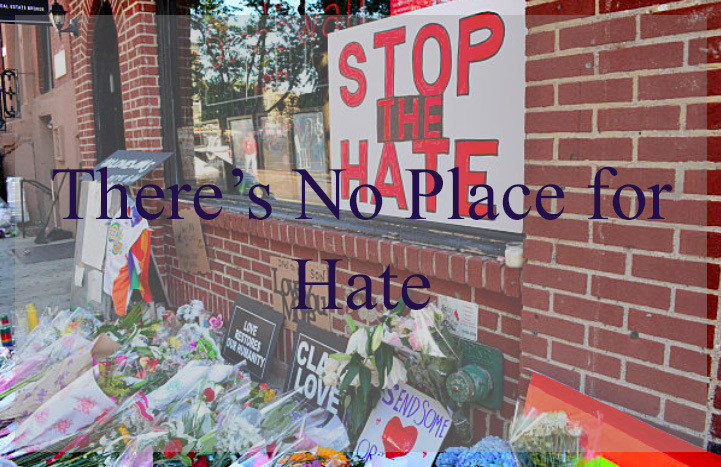 Let them know that hate has no place in this world. Show them how to be accepting and open to the many differences people have. Most importantly be an example of what this nation truly stands for- Freedom and Equality! Because we all deserve equality and the same privileges as any other person. We have seen examples of hate that cause many mixed emotions in us of sadness, anger, confusion, and anxiety. These confusing times when the media has bombarded us with information that feeds into our fears, we need to take action to bring stability in our own lives. Take control. Although these times and events may seem overwhelming, we must begin talking about it in order to strategize for our success and overcome the hatred.